Sense blew Kickstarter away in 2014, raising $2.4m, and now the stylish sleep tracker is available to buy in all good shops for $129. Sense is the brainchild of James Proud, who upped sticks from South London to code like crazy in California and set up Hello, a smart devices enterprise with a whole team of Valley boffins behind it. The big sell of Sense, when it hit the scene, was that it specialised in monitoring your sleep environment as well as your own fleshy form. Much like the Withings Aura, it's a two part setup that delivers all of its sleep tracking and analysing abilities. So, did it have a problem with our bedroom and does owning Sense make any? We've slept on it and this is what we decided. Sense is the best looking and easiest smart home product to live with since the Nest thermostat. And that's not something we say lightly. It's not a sleep tracker that you put round your wrist, nor one which you pop under the mattress. It comes in two parts. The main unit is small, discreet and sits looking very pretty indeed on your bedside table plugged into the mains. Aesthetically, it's a pleasure to have in your bedroom. It houses all the environmental sensors as well as the computational brains of the operation. It is, effectively, your sleep hub. The second unit is what's neatly known as the Sleep Pill and, yes, you can take two of them – one for you and one for your partner if you wish, although a second will cost you $49 extra. The Pill clips onto the edge of your pillow and has the accelerometers and gyros to detect your movement in the night. It stays in communication with the main hub by Bluetooth and has a coin battery that lasts for a year. Set-up is a doddle – even with two Pills – and up to two people can connect to the hub with their own private Sense apps which will display all the sleep data and impart specific advice for them. All good. Pillows can swap around when you're sharing a bed. So, we really like it that you can shake a Pill to find out if it's yours or your partner's. Each has an assigned colour, either red or blue, and the main unit will glow accordingly once you've had a rattle with the one that you're holding. Nice feature. Nicer, though – and nicest of all, indeed, out of the whole world of sleep trackers – is the glorious sleep sounds system that Sense has built in. Before you drop off, you can select an aural treat to help you on your way. There are 11 to choose from, including Autumn Wind, Fireside, Rainfall, Forest Creek, Brown Noise and White Noise as well as a selection of what sound like CDs from 1990's hippy shops. You can set the volume and allow them to play for as long as you like. On the whole, they're really, really nice and, to be honest, it's almost worth owning Sense for this feature alone, along with its good looks. 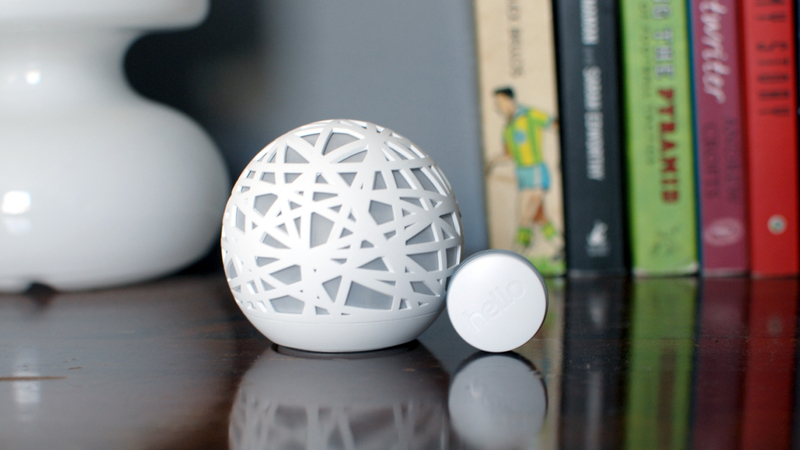 The sound itself comes from the Sense hub rather than your phone and the quality is bang on. Of course, the headline sleep feature is the environmental monitoring. Sense is tuned in to examine levels of luminosity, temperature, humidity, air pollution and noise pollution. It also has a proximity sensor so that when you wave your hand near it, it'll light up in a certain colour to tell you if conditions are ripe for kip. Red is, obviously, a no-no; yellow means something in your room might need a rethink and green is a-ok. There are also some other colours for more mundane activities like Bluetooth pairing. That all seemed to work very well. Sense was smart enough to understand that the curtains in our room are pretty thin and quite correctly suggested that luminance was a little more than it should be – more than 66% of the rest of the community as it went. Of course, then there's the issue of what we're supposed to do about it; invest in some new curtains, well, maybe. What about sell up and move because you live in a place that's too hot or near a major junction where there's not much you can do about the noise? Less likely perhaps, but that's not really the fault of Sense and there are things one can do with air conditioning, double glazing etc. The point is that Sense does its job here. It's up to you how seriously you want to take your sleep. Lastly, given that it's got a light with some nice colours inside, it would have been nice to have a go at using them to bathe your room in some kind of shade suitable for stimulating sleep hormones as Withings Aura does. It might be utter nonsense but it doesn't half look pretty. In a way, the actual sleep tracking functions of Sense are somewhat secondary. Which is lucky, because they're not very good. Sense doesn't claim to be able to know when you're in REM sleep but it does jot down your onset of sleep, when you wake up and your heavy and light sleep cycles. That's all recorded by the Pill. In actual, fact, certainly on the hardware side, there's really nothing more inside the Pill than you'd find in a fitness band attempting to measure your slumber. There are movement sensors and that's about it. So it's small wonder that Sense was usually late to detect that we'd dropped off and far too keen to suggest that we'd woken up when really it had just been that lighter, dreamier sleep of the morning. It was also pretty easily disturbed by any tossing and turning that our partner did, whether it woke us or not. Accordingly, the smart alarm feature wasn't much use. Sure, you can set it to go off within either 15 or 30 minutes of your usual wake up time and we did like the way you can tap the hub to snooze but it was never able to correctly pick a moment to make us wake up feeling refreshed. As it goes, we got better readings from wrist-worn devices despite trying all sorts of different pillow positions for the Pill as well as switching between the two different ones that we had. All in all, compared to other dedicated devices we've looked at – Withings Aura, S+ by ResMed, Beddit – Sense was a long way behind. If the granular details of your nightly patterns is what you crave, then Sense is not the one for you. Aesthetics and user experience are obviously the strong suit for Hello and Sense and, once again, actual functionality is a touch behind. The apps looks as good as the best wearable mobile software out there – think Misfit. It's easy to find everything you need and it's all very tastefully done. While there are plenty of nice, clear, graphical illustrations of how your last night went and what your averages are over time, it's not possible to drill back down into individual previous nights and really get into the nitty gritty of what's going on. Despite recording plenty of data, there isn't the opportunity you get with other sleep trackers to compare some of the variables like light, noise, temperature and such with the quality of your shut-eye. Plus there's not really any consideration for other factors like alcohol, caffeine, exercise and stress, all of which play a crucial part in sleep. In a slight, walled garden, Apple-like approach, all of that possible complication is taken away from the user and placed into the hands of the sleep coaching system which pops up with the odd tip on your timeline. The trouble is that the coach isn't that smart at present and what we got in the way of advice was very generalised and not particularly helpful at all. A smart coach needs to start producing within a matter of weeks. We used Sense for closer to two months and have still had very little in return. Sense isn't a great sleep tracker – so if tracking your sleep is what you want, just stop right here. It is, however, a very nice smart home object. It looks great, it fits into your lifestyle and its sleep-inducing functionality makes it just about worth buying if you live in the States where the price tag is reasonable. Elsewhere, however, Sense is insanely expensive for what you get. It could be a big help for those wishing to make sure that their sleep environment is up to snuff but there are other devices that do a similar job and actually track your sleep far more accurately too. Hopefully, Hello will come up with a version of the Pill which is a little more sophisticated. Until then, Sense is a tough one to recommend.